To help keep your clients and your business healthy, improving your day-to-day productivity as a massage therapist is an important investment. Whether you work for a massage clinic or run your business from home, there are a few things you can do to improve your productivity. Since working as a massage therapist requires long periods of standing, you want to have enough room to move around the table without having to round your back. This is important as you need to remain free from injury to be able to perform at your best and continue giving treatments back-to-back throughout the day, every day. Your room should be big enough to be able to ideally leave at least 90cm of space around the table to move around and work in. Getting rid of items or pieces of furniture you don’t need. For those working from home, this may even be as simple as rearranging or removing decorative items such as pot plants that are taking up free space on the floor. Positioning items in the room so that you have ample space to move around the massage table. Investing in functional storage. You can purchase storage spaces or shelves that can double as decorative statement pieces to achieve both function and aesthetic. The massage table is one of the most vital pieces of equipment in your work space. Clients must feel supported and comfortable, and you want to ensure the table is fully adjustable and easy to work with. Having the right height table is crucial to your comfort and ability to perform a massage free of pain or strain, and tables should be adjustable so that you can quickly and easily cater to the height of your client. Aside from ergonomics, consider if the massage table is pleasing to look at and fits in with the room decor. This can make all the difference in the comfort and satisfaction of your clients, as a professional space with the correct equipment is a tried and tested way of achieving better productivity and client happiness. It’s important to properly prepare the room prior to a client’s arrival to not only ensure all your appointments run smoothly and to schedule, but also to maximise their comfort and the overall massage experience. Set up towels and oils, top up any solutions, and lay out any candles and soft music before your client arrives. Streamline your appointment management processes by using an appointment scheduling software and online booking system. 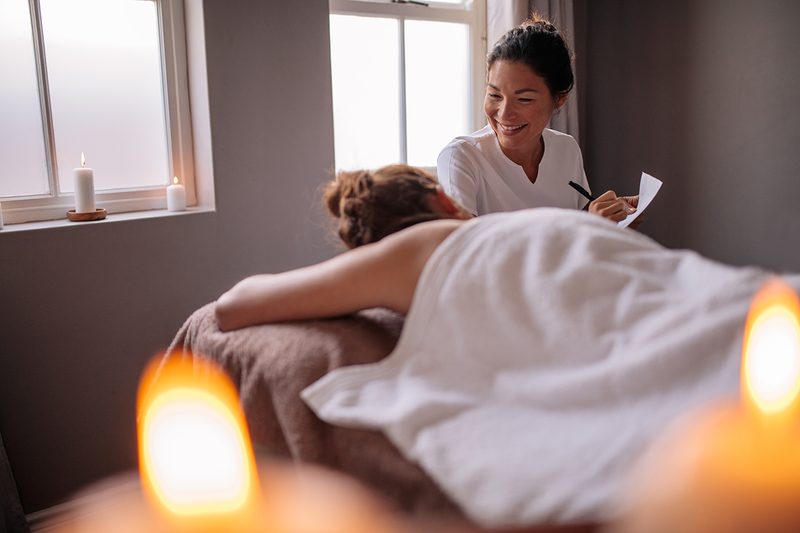 These tools make it easier for massage therapists to schedule appointments, and take the stress out of day-to-day management to allow for more focus on client treatments. This software allows clients to book appointments or send enquiries online, reducing the need to answer phone calls during appointments or having to spend your downtime managing appointment lists. Your productivity and performance as a massage therapist rely on you being in good physical shape and free from aches and pains. Allow for sufficient break times between clients where you can take 10-30 minutes stretching or doing a quick restorative routine such as yoga or pilates. If you’re short on time you can also easily perform some wrist, shoulder, and back stretches while standing to ensure proper blood flow and to counterbalance the repetitive movement of performing massage. Being in good physical condition and free of any pain or soreness will allow you to give your very best massage technique and in turn, give your clients the best treatment. Learning while you’re working is important for improving productivity, especially as a massage therapist. Equipping yourself with the latest in massage techniques and learning more about effective business management can help improve your client-relations, boost your confidence, and set you apart from other candidates. Have a look at some of the courses on offer at Discover Massage to gain everything you need to become more productive in your job.